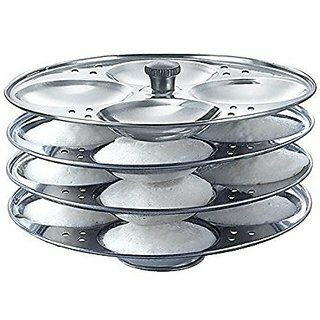 Excellent Quality Stainless Steel - Easy to Use The trays are stacked and secured through a center rod Excellent Quality Best Use For Home & Kitchen Use Awsome Kitchen Appliances Stainless Steel Idli stand stand with 4 Plates can make 16 Idlis. Entire set is easy to clean and wash, they have very exotic silver shining. Highly durable and made of fine food grade stainless steel. This set is made from high quality stainless steel making it exclusive and durable. This set has been beautifully designed to add grace to your dining experience. This set is strong in construction and will not bend or have dents during normal use. Uses:- This set has been beautifully designed to add grace to your dining experience. Makes 16 Idlis in one go. Contemporary minimalistic design to suit your refined taste. Stainless steel is hygienic to use and easy to clean as compared to other materials. All the utensils are of mirror finish and give an elegant look. When not in use this set can be nested one into another and therefore helping save shelf space in the kitchen This set is perfect for gifting purposes at weddings, anniversaries.